New Delhi, 2 February 2017: Cornitos, the flagship brand of GreenDot Health Foods Ltd brings ‘Peri Peri’ flavored Nacho Crisps for the nachos lovers. The brand is extending the palette by including this hot headed African flavor. ‘Peri Peri’ the popular raging flavor perfectly adds the exotic fiery delight to the consumer’s snack time. 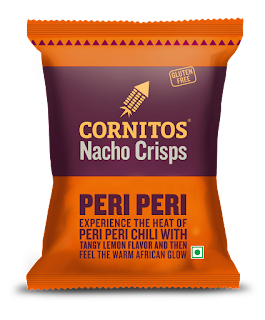 The spicy chilli flavor has become an international rage and with this newest offering Cornitos is keen to lure snack lovers into a journey of global taste. As part of their expansion strategy in National & International market the popular food product, Cornitos is extending its product range by adding flavors to the existing basket.